Consumers and health professionals are advised that GlaxoSmithKline Consumer Healthcare Australia, in consultation with the TGA, is in the process of recalling three batches of Children's Panadol 5-12 years suspension, supplied in 200 mL bottles. It has been identified that an ingredient used in the manufacture of these medicines may have been contaminated with small particles that could contain trace minerals and inert fibres. The quantity of these particles would be small and they may not be visible in the product. If this occurs, there is a very low risk of allergic reaction and there is also potential for the medicine to be less effective over time. 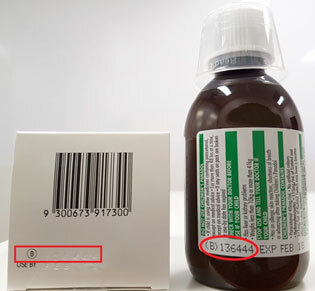 The batch number and expiry date are located at the bottom of the bottle label and embossed on the base of the outer box. No other batches, bottle sizes or products are affected by this recall. If you have a bottle of Children's Panadol 5-12 years suspension, check the bottle label and/or the base of the outer box to see if it is from batch numbers 136418 (strawberry flavour), 136444 (strawberry flavour) or 136443 (orange flavour). If you have a bottle from one of the affected batches, do not use it. Return it to the place of purchase for a refund. If you have any questions or concerns about this issue, speak to your health professional, or call GlaxoSmithKline Consumer Healthcare Australia on 1800 028 533. GlaxoSmithKline Consumer Healthcare Australia has written to wholesalers and pharmacies to provide further information about this issue, including details of the recall procedures. 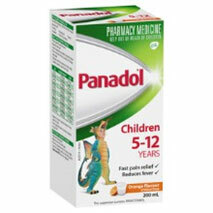 Pharmacies are instructed to inspect their stock to see if they have any Children's Panadol 5-12 years suspension from batch numbers 136418 (strawberry flavour), 136444 (strawberry flavour) or 136443 (orange flavour). If so, quarantine these products and arrange for their return in accordance with the recall procedures. If you are treating a patient who uses Children's Panadol 5-12 years suspension, advise the child's parent or carer of this issue. Advise them to check the bottle label and/or the base of the outer box to see if it is from batch numbers 136418 (strawberry flavour), 136444 (strawberry flavour) or 136443 (orange flavour). If they have a bottle from one of the affected batches, advise them to not use it and return it to the place of purchase for a refund. If you have any questions or concerns about this issue, call GlaxoSmithKline Consumer Healthcare Australia on 1800 251 905.